In this episode, I have a long and delightful conversation with my friends from the Beyond the Wall podcast. We discuss their show, the Game of Thrones TV show, the Song of Ice and Fire novels and all things GRRM, along with a few digressions. This discussion is LOUSY WITH SPOILERS, up through the first four seasons of the television show and approximately the first four novels (I got waved off of a topic on the border because of spoilers.) Be warned if you are not current on the TV show there are many spoilers about who lives and dies, and large plot points. Here is the direct MP3 download for the Evil Genius Chronicles podcast, April 2 2015. People who know about the inside working of big publishing, I need your help. I have been hearing people talk about ebook editions that appear to have OCR type errors in them. This sounded suspicious to me, in that “publishing can’t possibly be doing what I think they are doing” type way. I have now some examples in captivity. I own all of George R.R. Martin’s Song of Ice and Fire books in hardcover but I am reading them on my Kindle. Who wants a 10 pound book smashing their face at bedtime? 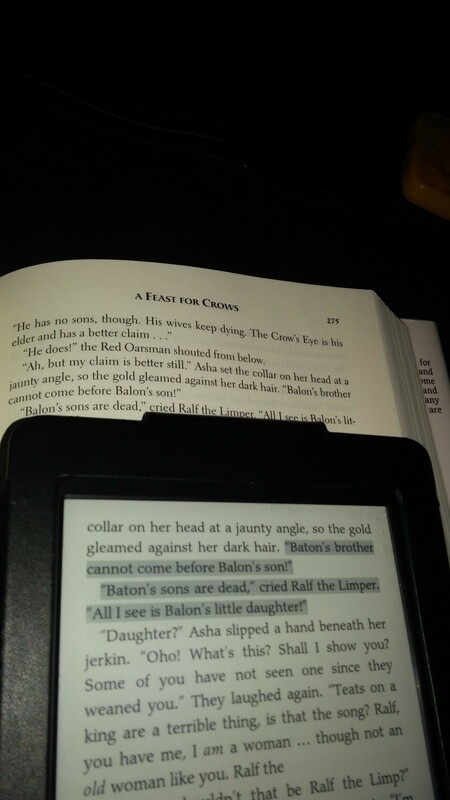 I noticed these errors in the passages of the kingsmoot, where Balon Greyjoy is referred to many times. There is a stretch of two paragraphs with half of them “Balon” and the other half “Baton.” If the image is too small to read, follow to the blog post and click it and you’ll see a pretty large version of it. I highlighted the passage on the Kindle just to make it extra obvious. The question is this: do the big publishers prepare their texts for commercial ebooks by scanning and OCRing typeset versions of the text? In other words, is there no way for them to capture the final edited version in a soft copy that could then end up in the ebook version? I’m withholding judgement until I understand this better but it seems remarkably backwards to me. If the electronic copy can introduce additional errors from the paper versions, something in the workflow seems amiss to me.